The North-West University (NWU) recently played host to the International Society for History Didactics (ISHD) and the South African Society of History Teaching (SASHT) at the first ever international conference related to history and education in Southern Africa. The conference with the theme “History from the core to zero gravity” took place at the Riverside Sun in Vanderbijlpark. According to Prof Elize van Eeden, an ISHD board member, SASHT president (at the time of the conference), and well-known historian and lecturer from the NWU’s campus in Vanderbijlpark, the conference was aimed at bringing together researchers and educators of history to network, collaborate and share experiences and best practices. Dr Falk Pingel from the Georg-Eckert Institute in Germany: “Nation, supra-national communities, and the global Unifying and dividing concepts of collective identities in History teaching”. Mr Michael Harcourt from Victoria University of Wellington in New Zealand: “Teaching ‘difficult history’ in an era of high curriculum autonomy: A New Zealand case study”. Dr Kate Angier (on behalf of Prof Peter Kallaway) from University of Cape Town: “Knowledge for the people: Understanding the complex heritage of colonial education in South Africa”. During the conference educators, academics and researchers were not only given the opportunity to attend a variety of presentations and a panel discussion on textbooks in history; but also had the privilege to attend the Van Schaik Publishers book launch of the academic textbook Teaching and Learning History and Geography in the South African Classroom. This textbook is widely regarded to be the first of its kind to consider teaching and learning of both history and geography as interconnected disciplines within the South African context. The book represents a collaborative effort between several research experts in both history and geography, with Prof Elize van Eeden and Dr Pieter Warnich, a senior lecturer in history and social sciences education at the NWU’s campus in Potchefstroom, as the editors. 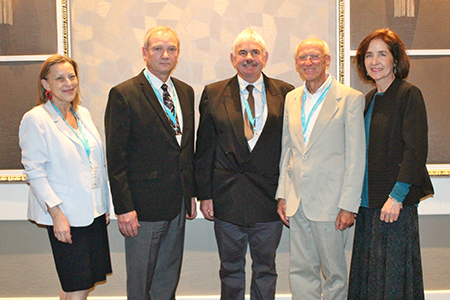 Prof Susanne Popp (President, ISHD), Dr Herman van Vuuren (NWU, Faculty of Education), Dr Pieter Warnich (NWU, conference chairperson), Dr Falk Pingel (Georg-Eckert Institute, Germany) and Prof Elize van Eeden (outgoing SASHT president).